Sitting at a stoplight I gazed around the neighborhood. Across the street was a crow on the wire hanging out in the cool dawn. The light changed. 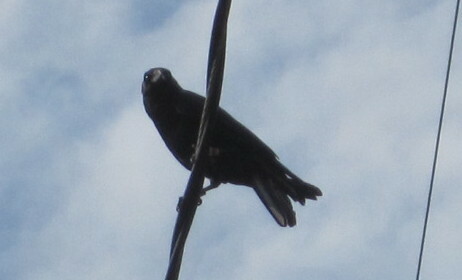 I started through the intersection and to my amazement the crow flew into the street. Don’t worry he didn’t jump in front of my car. He was off to my left on the cross street that had just stopped so I could cross. This crow was staring at the stoplight. When it went red, he jumped into the car free street. He knew they were controlled by the light and it was safe to get the morsel he had scoped out. How smart is that? To have observed the intersection and how the traffic signal controlled the cars. He used that knowledge to get his breakfast in the middle of the street. Stay alert for smarty pants crows! Nature is amazing.